The GBP/USD pair had good two-way price moves on Wednesday and was influenced by a combination of diverging forces. After a rather muted reaction to softer than expected UK inflation figures, the pair witnessed a dramatic turnaround and rallied to weekly highs, near the 1.2960 region. The sharp intraday bullish spike was triggered by fresh speculations over a possible extension of Article 50. The rumours, however, were suppressed by the UK PM Theresa May's comments at the House of Commons, reiterating that government's position is that we want to leave on 29 March. This combined with some renewed US Dollar buying interest prompted some aggressive selling at higher levels. Having snapped an eight-day winning streak in the previous session, the greenback regained positive traction on Wednesday and got an additional boost from better than expected US inflation data. 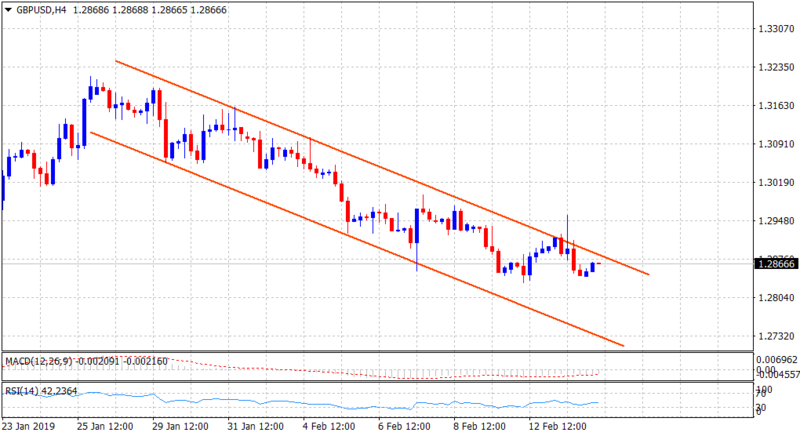 The pair retreated over 110-pips and dropped back to retest three-week lows support, around the 1.2850-45 region. The selling pressure now seems to have abated, rather the pair caught some bids during the Asian session on Thursday in wake of the news that 40 former British Ambassadors call on the UK PM May to delay Brexit. In absence of any major market moving UK economic releases, the incoming Brexit headlines might continue to influence sentiment surrounding the British Pound and act as an exclusive driver of the pair's momentum. Later during the early North-American session, the US economic docket, highlighting the release of monthly retail sales data and the PPI print, might produce some short-term trading opportunities, albeit the reaction is more likely to remain limited. From a technical perspective, the overnight bullish spike did lift the pair beyond a short-term descending trend-channel but the subsequent retracement turned it to a fake-out. The top end of the mentioned channel, currently near the 1.2885 region now seems to act as an immediate hurdle, above which the pair is likely to aim towards retesting the 1.2955-60 supply zone before eventually darting to reclaim the key 1.30 psychological mark. On the flip side, the 1.2850-45 zone might continue to protect the immediate downside, which if broken might turn the pair vulnerable to extend the downward trajectory towards challenging the 1.2800 round figure mark. A follow-through selling has the potential to drag the pair further towards the trend-channel support, currently near the 1.2740 region.